The link below provides the old answer to this question. The new YouTube playlist play interface is very different. So, what's the trick now? Tired of searching! How can you transfer your playlists from one YouTube account to other? Navigate to the URL of the playlist you want to copy. Click on the menu button on the right (3 vertical dots). Either add the videos to an existing playlist or create a new one. On the playlist page, starting with the last video on the bottom of the playlist so they will be in order, add all the videos to "watch later" (there is a little button in the corner of the thumbnails). Be sure to select all of them. Go to video manager > watch later in the left bar (this doesn't show up in playlist view so open up youtube.com in a new tab). Click the select all box. Click the playlist drop down, then select add to new playlist. Give it a name and a privacy setting, then click create new playlist. To check to see if it worked go to playlists in the left bar and open the one you just created. Go back to your watch later list, select all and click remove to clean up. With YouTube's new interface, there is a blog entry that shows you how to copy playlists in YouTube: Copy Playlist. It uses a third party service: http://youtubeplaylist.net. It really helps me out of managing playlists. I just found out another alternative for grabbing someone’s playlist by accident (though the playlist appears in your channel, you don’t actually copy their playlist to your own collection of playlists). I was trying to delete playlists on the desktop, but I noticed some extra playlists there were appearing in my tablet. These playlists were in the vertical menu bar on the left, and I couldn’t delete these particular playlists. Going back on the desktop, I didn’t see these playlists when I clicked on “playlists” on the top, which is to the right of your name. I found out that they weren’t actually my playlists. I initially didn’t know why someone else’s playlist were showing up in my list of playlists, but then I noticed that I had liked their playlist. Liking a playlist will add it to the “playlists” section in the vertical menu bar on the left (not the top). I suppose that the “playlists” on the left are your playlists, as well as other people's playlists that you have liked. Not the answer you're looking for? Browse other questions tagged youtube youtube-playlist or ask your own question. How to load a YouTube playlist? How to programmatically add videos to YouTube playlist? 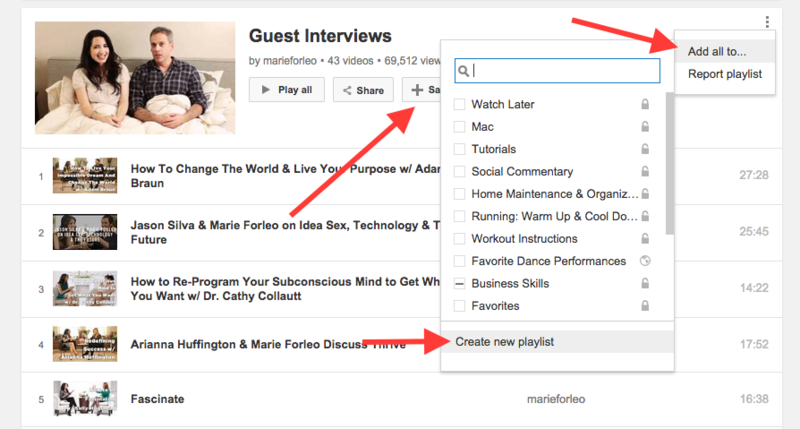 How can you save a playlist in YouTube's new interface? How can I access the “more from this user” playlist in the new YouTube design? How to access the “Videos uploaded by” playlist in someone's channel? How to move multiple videos from one YouTube playlist to another, at once?